Our bus for Patras leaves in the early afternoon, so we have plenty of time after breakfast to pack our belongings and even take a final walking tour around Delphi. We carry our backpacks to the tiny bus station at the edge of town, about a hundred meters from our hotel, and claim a small table on the sidewalk. The only other table is already occupied by a British girl waiting for the same bus. To pass the time we settle in for a game of cards, which stretches longer than we expect. The bus is running a bit late because of the various pickup fares in small villages. When it finally arrives, we discover there are few seats available. Duane and several others must stand in the aisles until some of the passengers get off at the next stops. The road down the mountain is extraordinarily twisted. I would not want to drive a small car here, but the driver manages to swing the bus through many tight, hairpin turns as we descend to the Amphissa plain and towards the port of Itea on the sea. The entire region is planted in olives, all the way up the hills in every direction. Amphissa olives are famous throughout Greece. We make several stops in tiny villages, and some passengers get off – leaving seats for others. At the bus station in Itea, just across the street from the waterfront, we discover that all passengers continuing to Patras must wait for the next bus. We join a number of passengers to collect our packs, and then settle down on the sidewalk to wait. Duane walks to the bakery a few doors away and buys tyropitas (cheese pies) for our lunch. They are fresh from the oven and very tasty. We finish eating minutes before the Patras bus arrives. 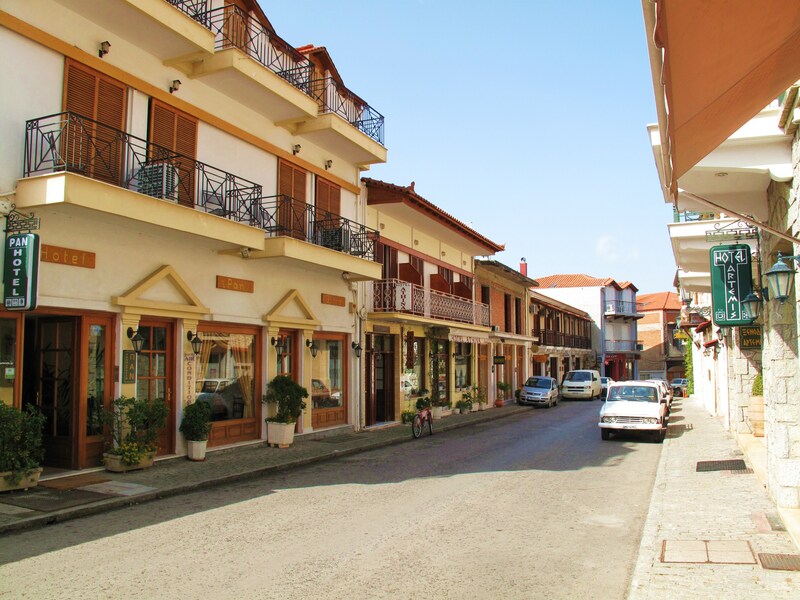 The trip to Patras is longer than we expected – or maybe it just seems so because of a many stops at small towns along the coast. It is several hours before we pass through Nafpaktos to the new Rio-Antirio bridge. Officially called “Charilaos Trikoupis” bridge, after a Greek statesman, it spans the Gulf of Corinth at its most narrow point, connecting mainland Greece with the Peloponessos. 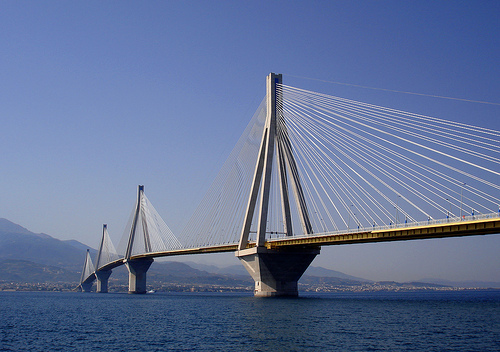 It is a beautiful bridge with giant towers and cables supporting the highway high above the sea. As our bus approaches, the bridge looks almost like a modern sculpture. Beneath it is the old Antirion fortress, which once guarded this part of the coast, and the ferry landing that still caters to those who prefer the sea route to Patras. On the southern side of the bridge is Rion fortress. It was built by Turkish invaders in 1499 and was the scene of numerous battles and revolts for centuries after. In 1532 it was taken by the Spaniards and Andrea Doria, and then retaken by the Turks. In 1603 the Knights of Malta wrought significant destruction. 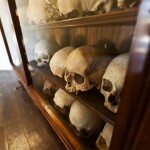 In 1687 it was taken by Morosini, a Venetian warlord. Drastic repairs were made and it received the form it has today: new towers – bastions, strengthened ramparts. The fortress was captured by the Turks in 1715. 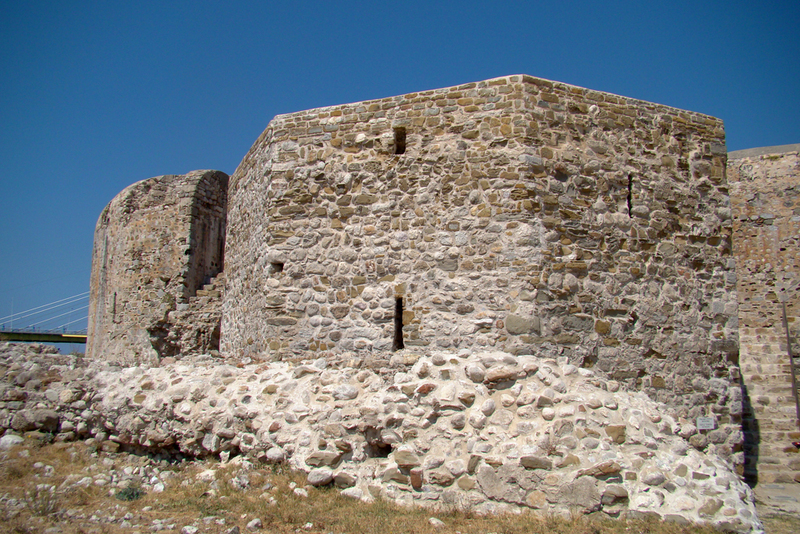 More than a hundred years later, after a siege, the Turks surrendered the fort to Greek freedom fighters. We are in Patras within minutes after leaving the fortress, and a short time later at the waterfront bus station trying to get our bearings. 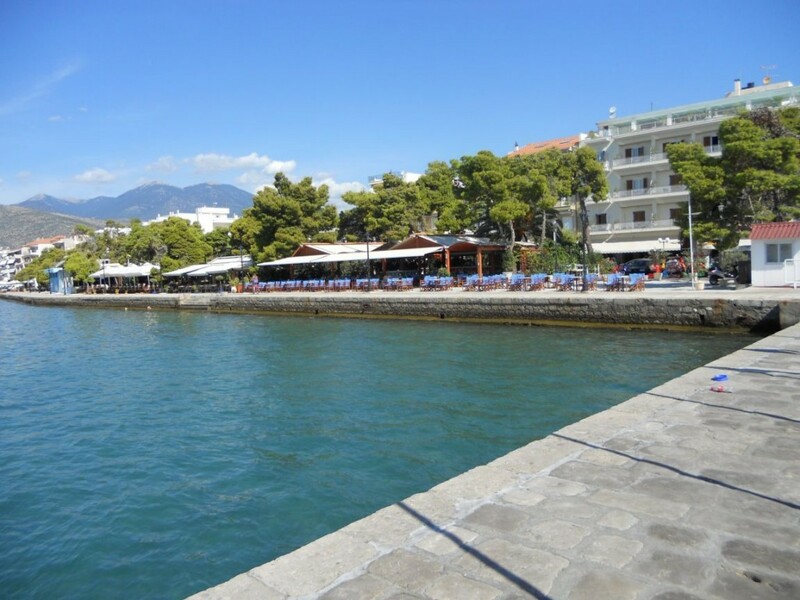 We plan to stay overnight near the port, so we can easily catch the ferry to Kefalonia. However, on the map this bus station seems to be farther west than we expected. Duane decides to hike eastward on the waterfront boulevard to find Tofalou street, where our rooming house is located. He returns a half hour later in a taxi, saying that our room, the ferry landing, and another bus station, are many blocks to the east. We take the taxi to our destination. The room is very nice, and only a few blocks from the place where we will board the ferry. We leave our backpacks and set out to explore the city. 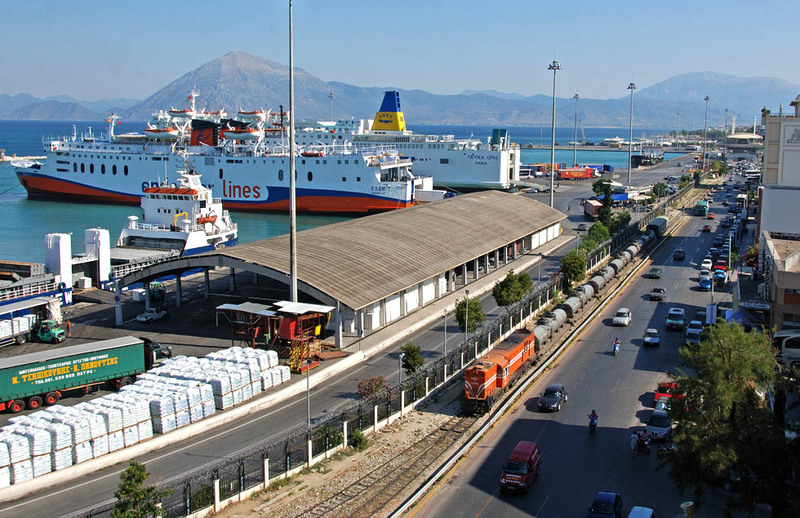 Patras is a fairly large and very busy port city that extends along the coast and up to the hillside to an old Venetian castle. 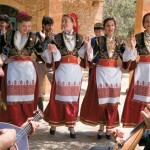 It is named after Patreas, the leader of Achaeans who moved here from Laconia more than 3000 years. It was a farming town in ancient times, but became an important port under Roman rule (it is the first major Greek port for ships coming from Italy). 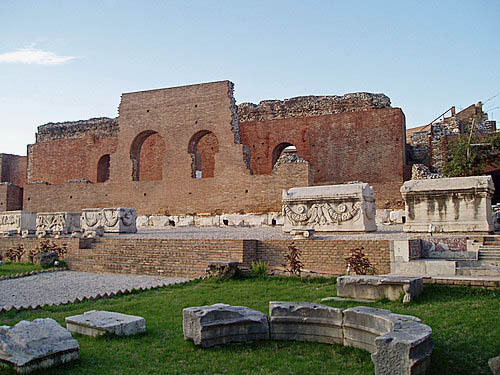 At the archaeological museum we find a lot of Roman artifacts, and we are told there are many Roman sites in the area. The most interesting Roman monument in Patras is the ancient theater, built shortly before the famous Herodeion in Athens (161 CE). 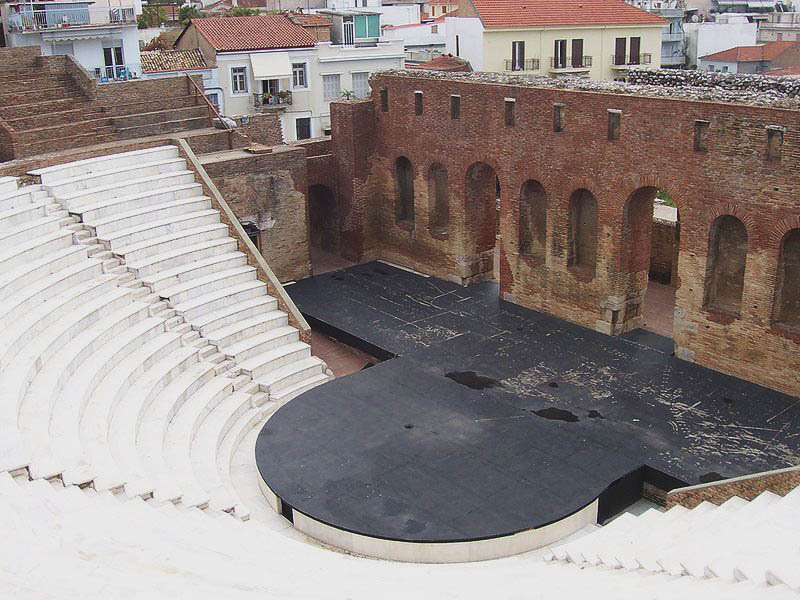 It was uncovered by archaeologists in 1889, and is now reconstructed and used for open-air performances and concerts during the summer. It was during Roman times that St. Andrew came to Patras to preach, and it was here he was crucified. 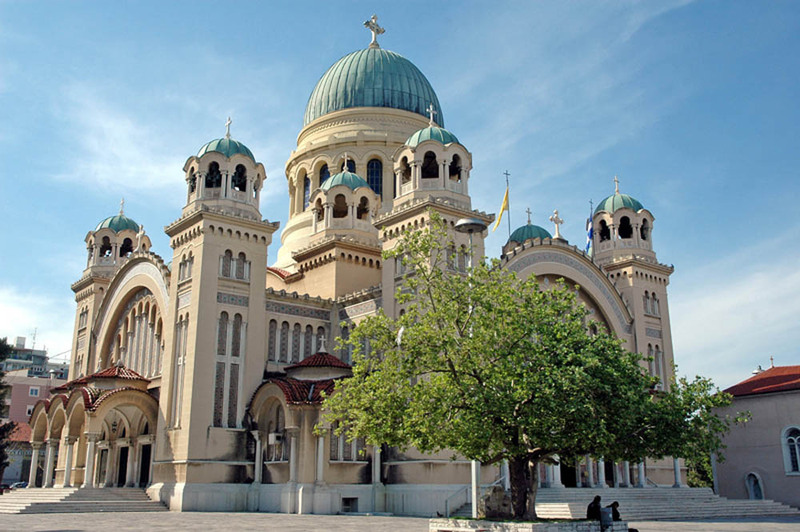 From then on he was considered the protector of Patras and nowadays there is a magnificent church on the exact place of his execution. It is a magnificent and rather new church contains the remains of the Christian martyr. During the Byzantine period Patras prospered, mainly due to the production of silk, but its wealth invited attacks by the Arabs and the Slavs. In 1205, it was conquered by the Franks, and then plundered by the Turks in 1460. Patras remained under the thumb of the Ottoman Empire for centuries, but played a crucial role in breaking free from oppression. 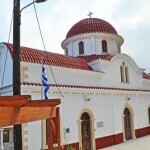 It was Bishop Germanos of Patras who raised the Greek flag at a local monastery and organized Greek patriots who fired the first shots in the War of Independence. In 1828 Patras became part of the free nation of Greece. Now Patras is a thriving commercial center with a large university and many visitors. We see as much as we can in one afternoon and evening. After finding a gyro cafe for a quick supper, we return to our comfortable room near the port. We must be rested for our journey to Kefalonia.